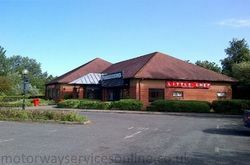 A former Little Chef where the A16 and A17 cross, now home to a host of familiar roadside brands. The Little Chef in 2011. In the 1960s a garage opened in the corner of this junction, replacing an existing building. Meanwhile, about a mile to the east, the Algarkirk branch of Little Chef opened in around 1970, also known as Thorley Farm services. It was a simple, small building with a car park. When the newly realigned A16 opened, Little Chef saw an opportunity to move out of the unsuitably small building and to build a new one here at Sutterton. This opened in 1991 and the old one became Steve Thorley Potato Equipment. This new branch gained a Burger King but had to become an EG Diner in January 2018 after the new owners lost the rights to the brand. In August 2018 the diner closed alongside the Burger King. Burger King reopened in October alongside Greggs and Subway stores which replaced the diner. 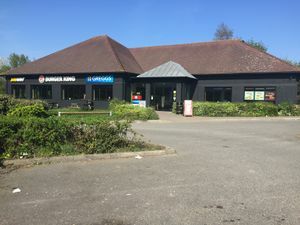 The filling station was formerly branded as Texaco and the site is a rare case of a Wild Bean Café not paired with M&S Simply Food or BP Connect. The Wild Bean Cafe lasted until 2019 when it was replaced by a hot food counter and Costa Express machine. A brand new filling station and restaurant are currently being built on the opposite side of the roundabout however signage is already up advertising both facilities. These are expected to open before the end of 2019.